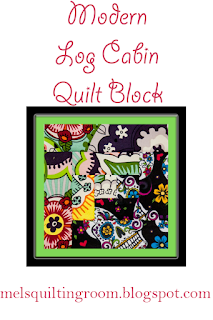 This week I am showing you how I make log cabin quilt blocks. I love the pattern and this block looks nothing like the ones you are used to seeing out there. I only used two fabrics, neither of which you would normally see and think "Oh yeah I can make a log cabin out of that." It's super busy so in a larger quilt I'd pair it with a much more neutral block to help tone it down. I wanted to make sure everyone has the basic log cabin quilt block down. We are going to be doing some variations in the coming weeks so it's important to understand the basic block before we move on to the other blocks.